As you all know my dad (Jason) is a great chef. Me on the other hand an 8 year old is picking it up! I have been looking in one of his little boxes of recipes for a long time, but we never seem to have any of the ingredients. 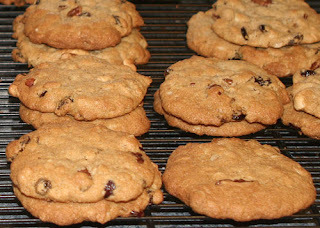 So today (March 8th 2010) I looked hard and I decided to make Raisin Cookies! But it was a secret I didn't tell anybody what I was making. After a while of putting things together I got done with all the ingredients I needed help stirring. So my dad came in still not knowing what I was making and stirred it real good. After that as you could imagine I had to tell him what i was making. So I did and he was very proud! So then we put 12 in the oven and we had 26 more in so there were 38 cookies in all! Thats a lot of cookies! When all of them were ready my dad and I shared one cookie! YUM! I had made my very own cookies! Even I was proud! Grind or chop 1 cup raisins-pour 1/2 cup hot water over them. Stir in 2 tsp.soda & let sit. Cream 2 cups sugar, 1 tsp. salt & 1 cup crisco. Add 2 eggs,2 cups oatmeal and 4 cups flour. Add raisins and 1 cup nutmeats. Drop on ungreased cookie sheet/ press with fork dipped flour and bake for 10-15 minutes at 375 degrees. Those cookies look delicious. You are going to have to send us some. I know Seb and Matt and Chris would love to try them. Nini would too, except he's in Japan, so they'd get eaten before they get there. Congrats on your very first batch of homemade cookies. May there be many more cookies in your future! Hazy! Wow, what a cool story! I can't wait to taste your cooking. You are very sneeky, making cookies without telling anyone! Those are the surprisses I like!